Article first published as Rafflecopter - Organizing Your Giveaways, Promoting Your Brand on Blogcritics. I like free stuff as much as the next person, though nowadays, I find even more pleasure giving away items to friends, family, and now to you, my loyal (or first time) readers. However, the process of collecting entries, selecting a winner, and distributing the prizes can be enough of a logistical headache that it takes all of the fun out of the joy of giving. Well, enter Rafflecopter, an amazingly simple and intuitive website application designed to give you all the tools you need to drum up some interest in your brand and make it easy to give away stuff to the masses. I got a chance to play around with the invite-only website, and I am also excited to announce my first official giveaway. Make sure you reach the end, but first, a look at the application. The first step to setting up your online giveaway through Rafflecopter is to conjure up a catchy title/nickname for your giveaway. 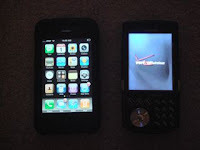 Next, you list your prize(s) - I've got a good one for this month's giveaway, so keep reading. In exchange for giving away a prize, you can decide how your readers will receive entries into the raffle. For example, I'm trying to get a Facebook page started for my blog, so I'll make the "Like" Chanatown on Facebook option a mandatory one, while those that "Follow @Chanatown on Twitter" or "Tweet About The Giveaway" receive additional entries (including one per day if they exercise the third option). The final step is to set a start and end date and time, and your HTML code will be ready to copy/paste into anywhere you want (like below). 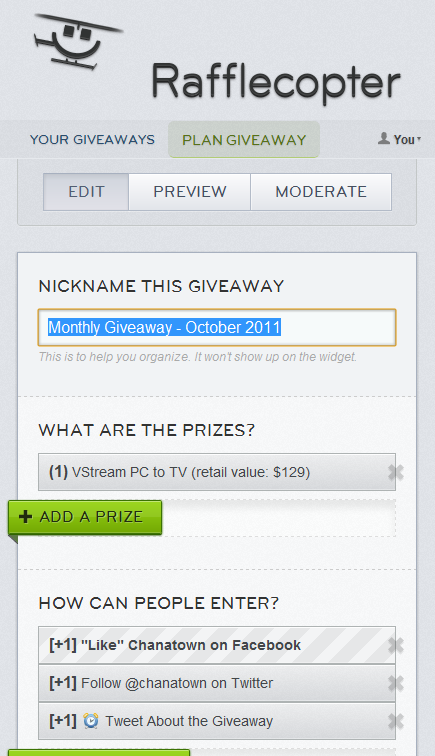 You can always go back and edit your giveaway and the widget code can be copy/pasted again to refresh. Once your raffle has ended, a winner will be chosen, announced, and you'll be on your way to handing out free stuff with the best of them. 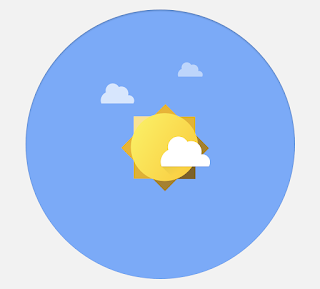 Again, I love the simplicity and elegance provided by the well designed application. Not to mention that the site practices what it preaches by being free itself (for now). Happy Raffling! For this month's giveaway, one lucky winner will be receiving the VStream PC to HDTV unit that I reviewed here last month. 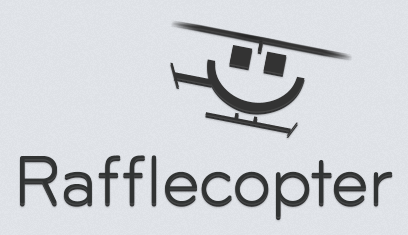 UPDATE (12/12/11): Rafflecopter is now out of its private beta and made some improvements to its code/interface. 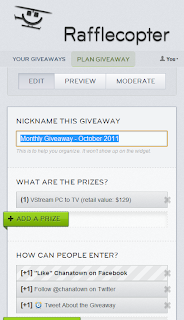 I highly recommend you give it a try if you're interested in running giveaways on your site. In the meantime, check out our monthly giveaway @Chanatown.